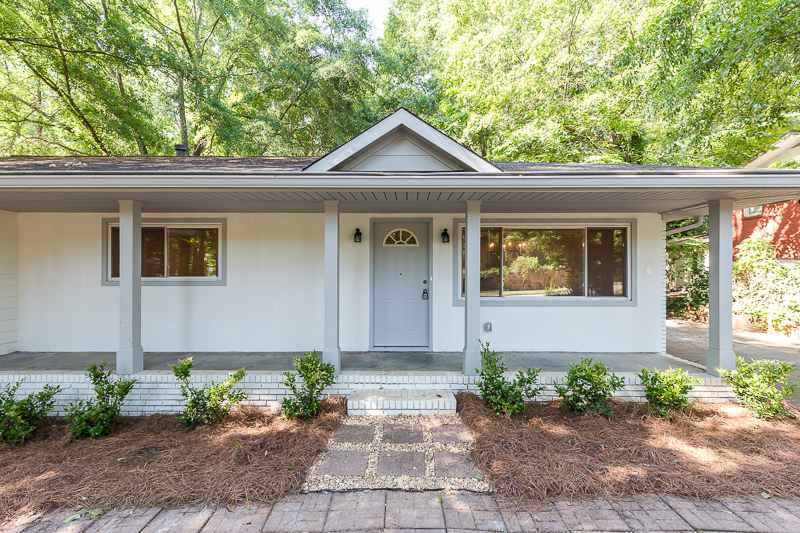 Throughout my years in Atlanta real estate, I have helped many investors grow their pockets with investment property flips. 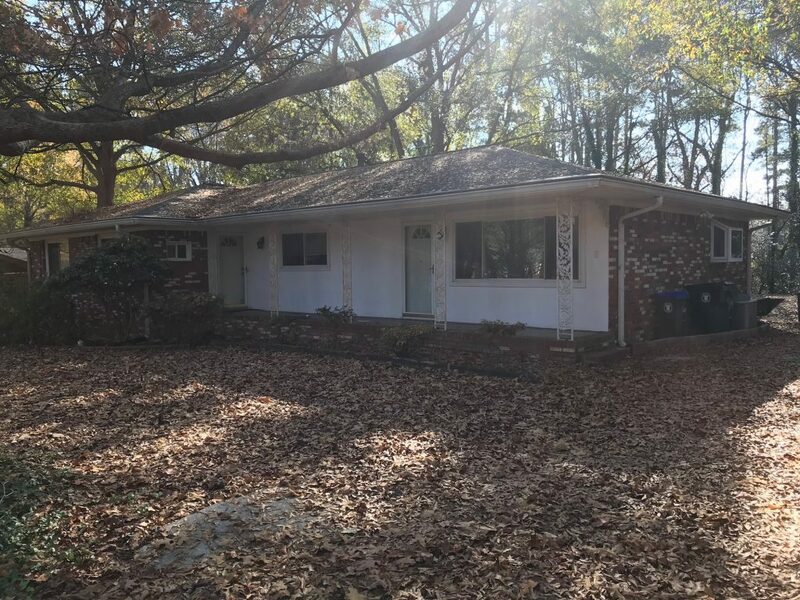 So last fall with the Atlanta real estate market on FIRE, and my husband and I looking for a new investment adventure, we thought we’d try our hand in a home flip of our own! In addition to scouring the MLS for potential properties, I signed up for emails from wholesalers to find off-market deals. 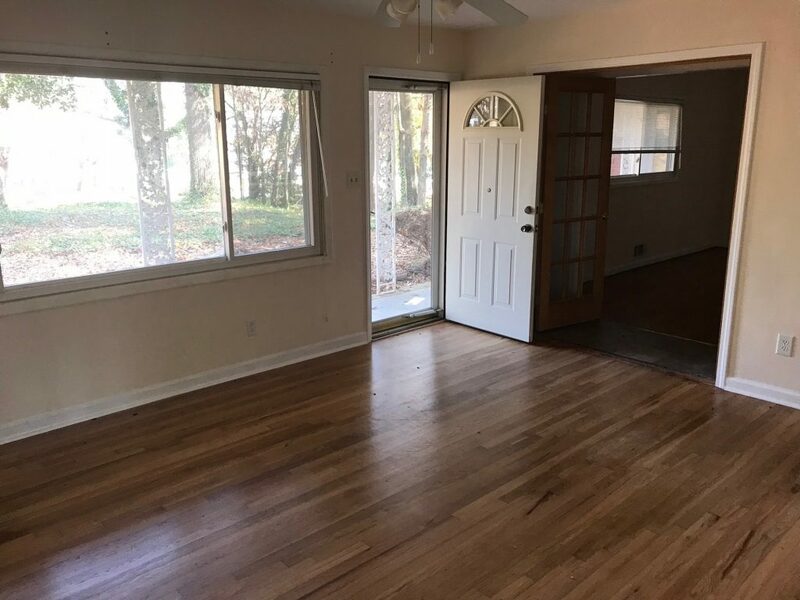 The property we ended up purchasing was close to our home (which was important to us to be able to check in on the contractors) and was listed in the MLS. We ended up getting the home for 10% under their ask price. We chose a home in a neighborhood I have sold several homes in (Wakefield Forest) that is close to our neighborhood of Ashford Park. We liked the proximity to major highways, parks, shopping, and other amenities. We liked the large lot, the fact that the home had a basement, and the ranch-style floorplan. 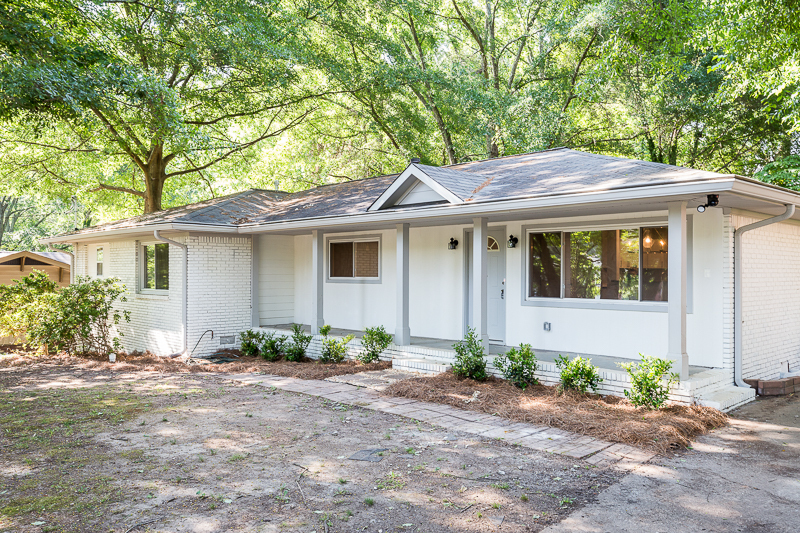 We purchased this home as a duplex with 2 beds and 1 bath per side. The biggest change we made was turning the second living room and kitchen into a large master suite with a huge ensuite bath and 2 walk-in closets. With the addition of that new bathroom, we decided to remove one of the existing baths and relocate the laundry out of the basement. We kept the other existing hall bath but completely renovated it. 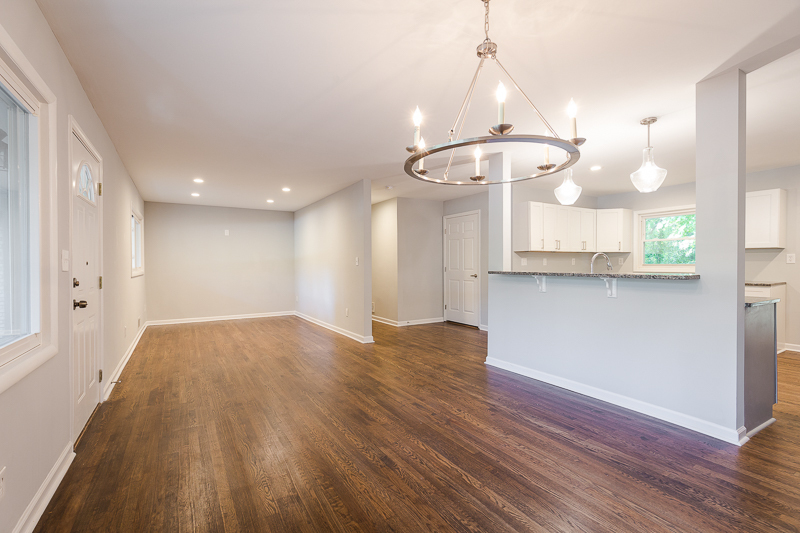 The other major change we made was removing a random wall in the kitchen to create a more open floorplan. 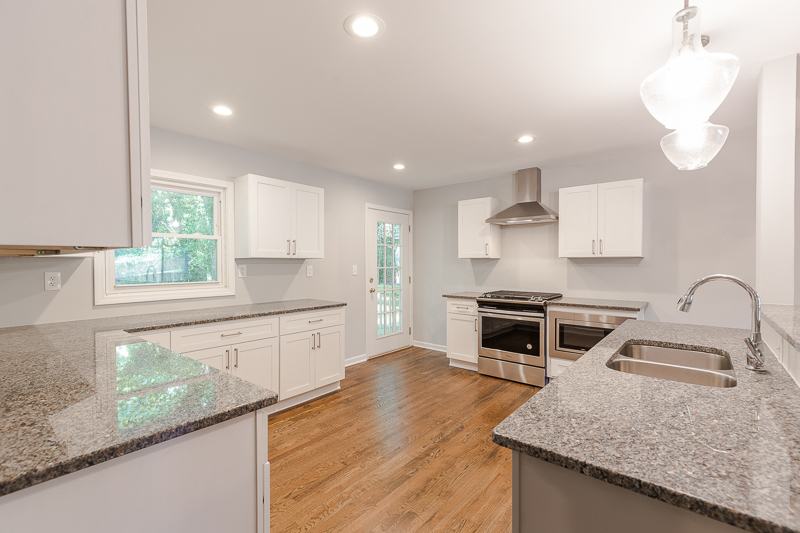 We put in an island with pendant light fixtures, white shaker-style cabinetry, granite counters, and subway-tile backsplash. 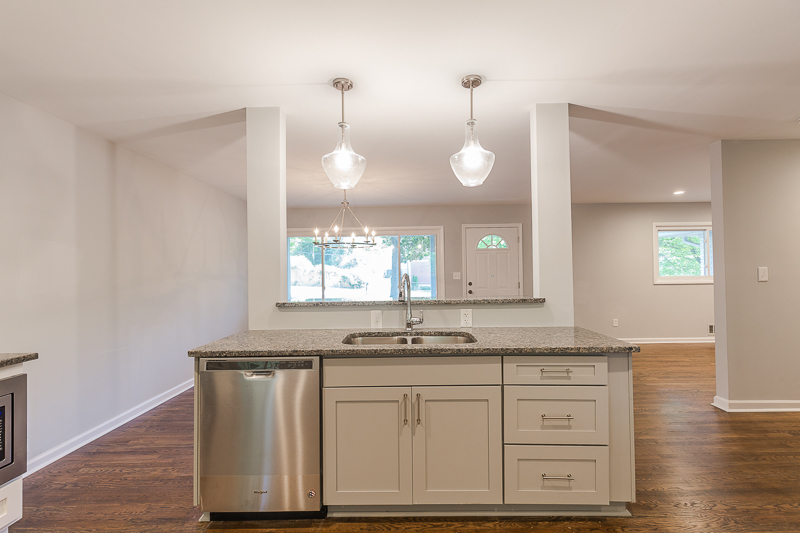 We also added in stainless steel appliances and a great vent-hood. In addition to the major changes, we added new doors and hardware, refinished the hardwoods, added new light fixtures, changed the roof-line, brought all of the electrical and plumbing up to code, removed some trees, added a new deck, waterproofed the basement, added a new vapor barrier, and painted the interior and exterior. Buying a home on a basement was the right move I think. It helped us easily move plumbing and electrical around which I think was crucial. I think, for the most part, the finishes we chose were spot on and appropriate for the price point of the home. Opening up the kitchen, relocating the laundry room upstairs, and changing the roof line are a couple of other things that I think were our smartest investments. We underestimated how much the location would bother people. 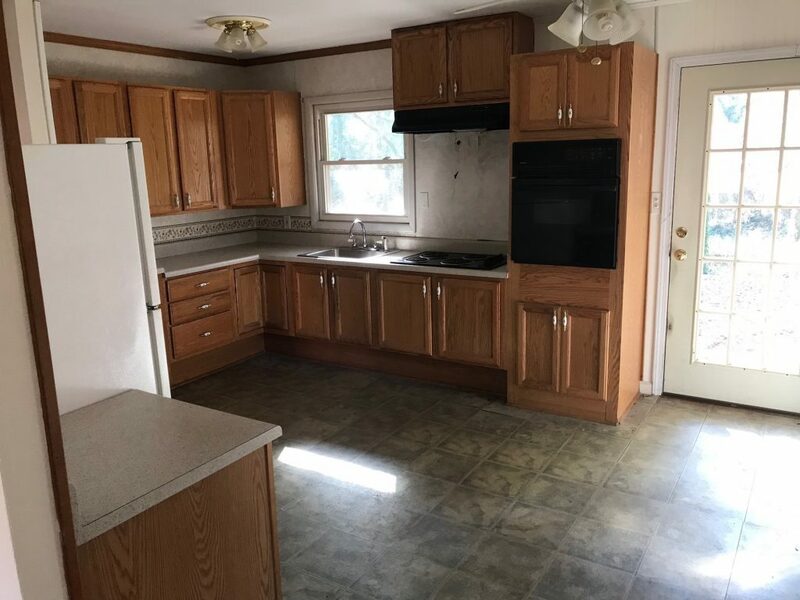 We knew the home wasn’t in the BEST location, but we thought we priced it accordingly and if people loved the home and finishes enough they would be able to get over the less-than-ideal location. The objection to location came up quite often during our listing period. We also underestimated the affect the neighbor’s dumpy front yard would have on ours. 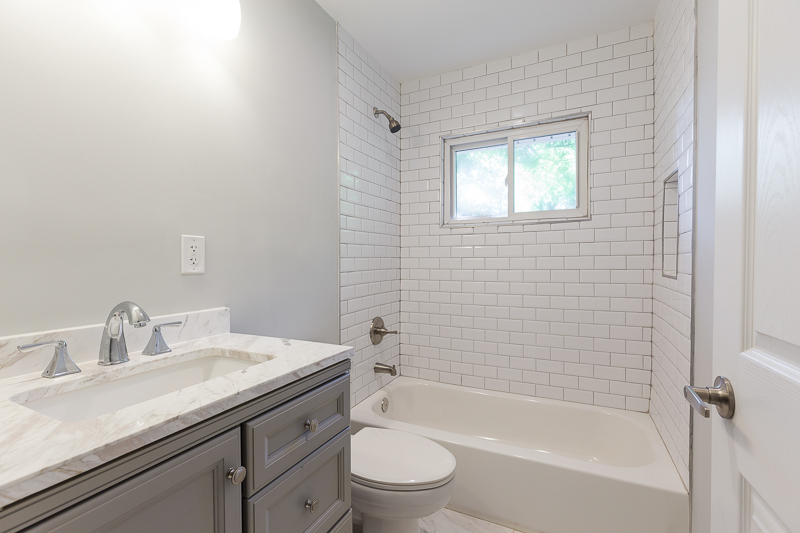 We overimproved and overspent on the master bath, thinking it would be WOW enough to sell the home. 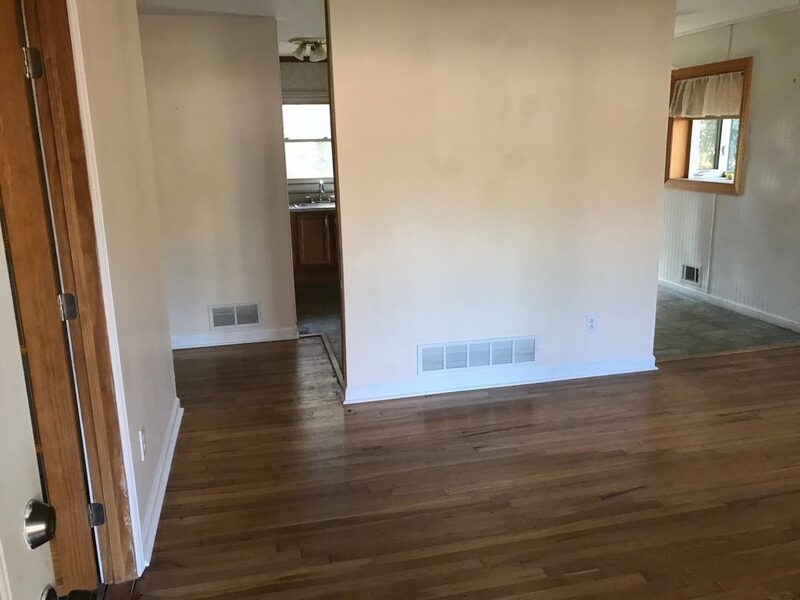 We did not do enough due diligence on the basement’s previous structural repairs and ended up having to spend a large chunk of money to reinforce the slab and do waterproofing in the basement. We didn’t budget enough for landscaping and a fence. We didn’t monitor and manage the contractor’s timeline closely enough. After a couple of months on the market, and a low offer we weren’t ready to accept, we ended up leasing the home to a great family. While it would have been better for us financially to sell, we felt like we missed the spring market and would be leaving money on the table if we let it go for the amount of the offer we received. We own the home outright and paid cash for all of the renovations, so the carrying costs for the home are low. If we flip again, we will seek out a home that needs fewer structural changes/walls opened up. I will stick to more simple updates and cosmetics. 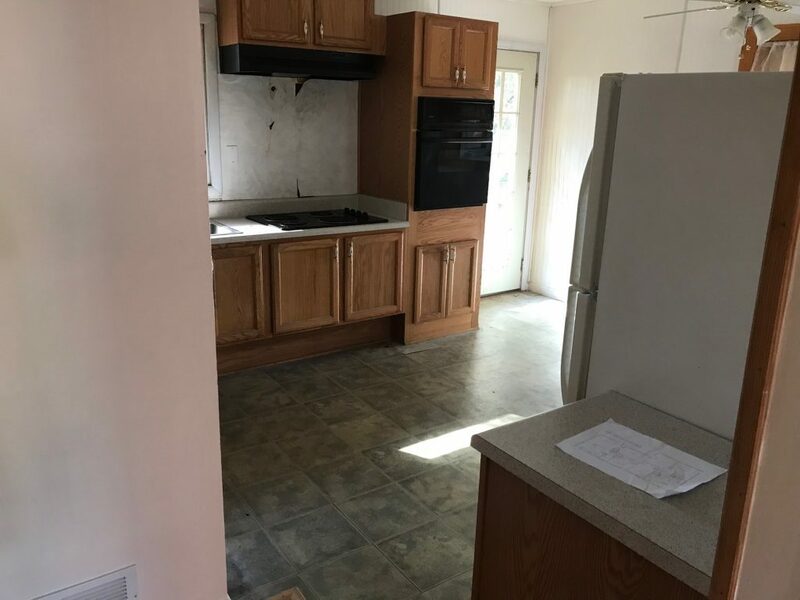 We will not hire a General Contractor to manage the project in the future, and would manage my time better to ensure I am available to oversee the project. I can’t say many good things about the GC we hired, other than his expertise in the permitting process was helpful. Next time though, I will just hire my own subs. We will manage the budget a little better to allow more for landscaping. 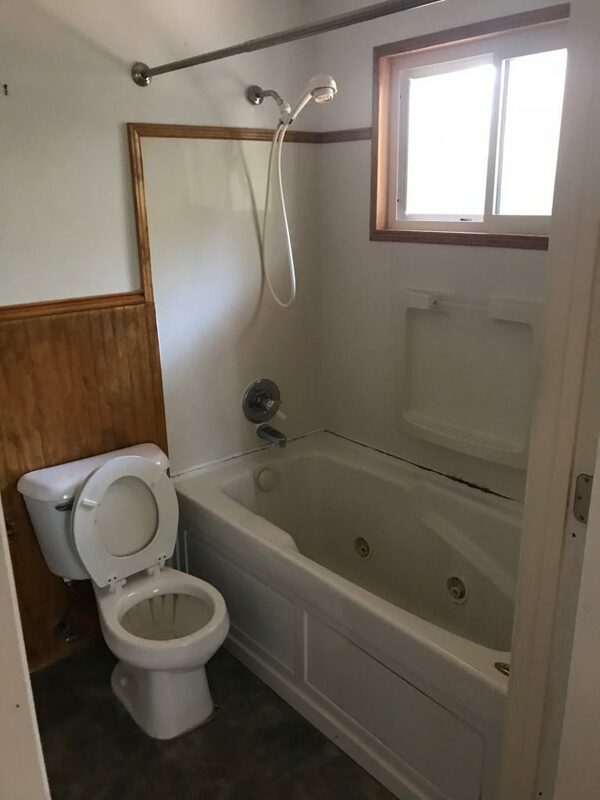 We basically had to throw this together at the end of the reno and I think this was another obstacle that kept us from selling. I will scale back on my bathroom finishes. 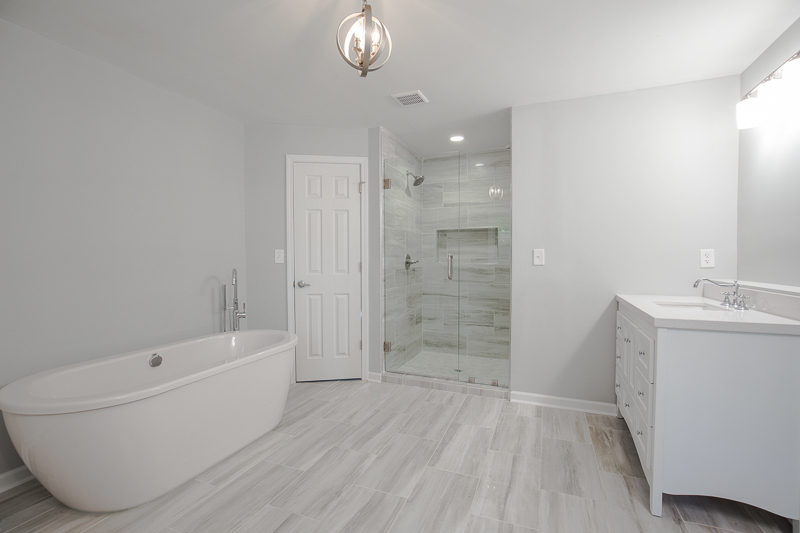 I made this flip’s master bathroom look like my master bath (and my home is worth 3x the amount of this home so it doesn’t make much sense to overspend)! 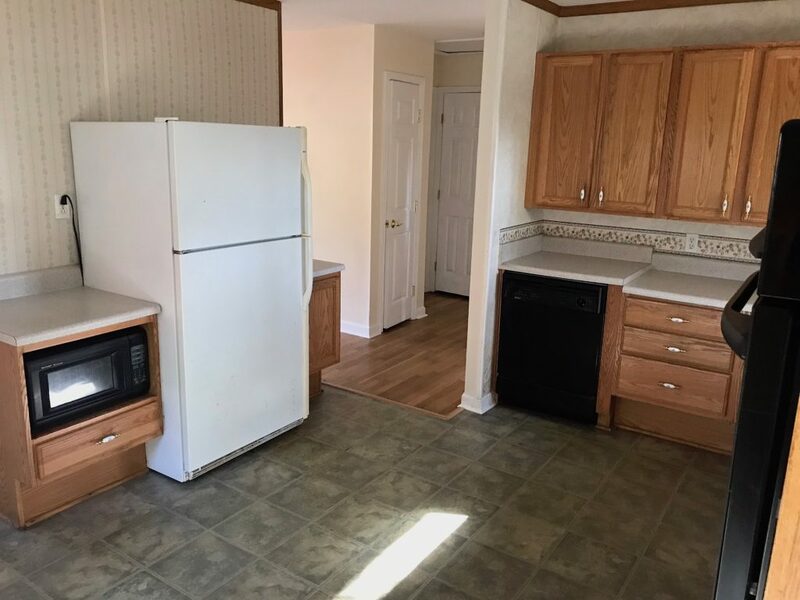 The old kitchen was outdated and boxy. We opened it up and updated it with contemporary yet classic finishes. The fridge used to be on the other side of this wall. We opened up the wall to create an island perfect for entertaining. The old bathroom had ugly wood trim and paneling. The new bathroom is crisp clean! This secondary kitchen was easily transformed into a luxurious master bathroom. We went with white, as it is very buyer friendly and on-trend! The old living room was dark and closed off. We opened up the wall and added fresh paint and new light fixtures. e market adjusts downward from the time you buy until the time you sell. 2. Manage it yourself. I had so many issues with our GC (including issues I am STILL trying to resolve). I spent so much time and effort correcting mistakes and oversights, I would have been better off managing it from the start. 3. Follow the 70% rule. This states an investor should pay 70% of the ARV (after repair value) of a property minus the repairs needed. 4. Don’t use your life savings on the flip. We were lucky we had some liquid funds and were comfortable tying that money up in this home. If you are looking for something with a quick return, flipping might not be for you. Market conditions can change and it can take months to get your money out of the project. Or worse, you don’t want to use up your liquid funds and leave a half-finished house. 5. Start small. 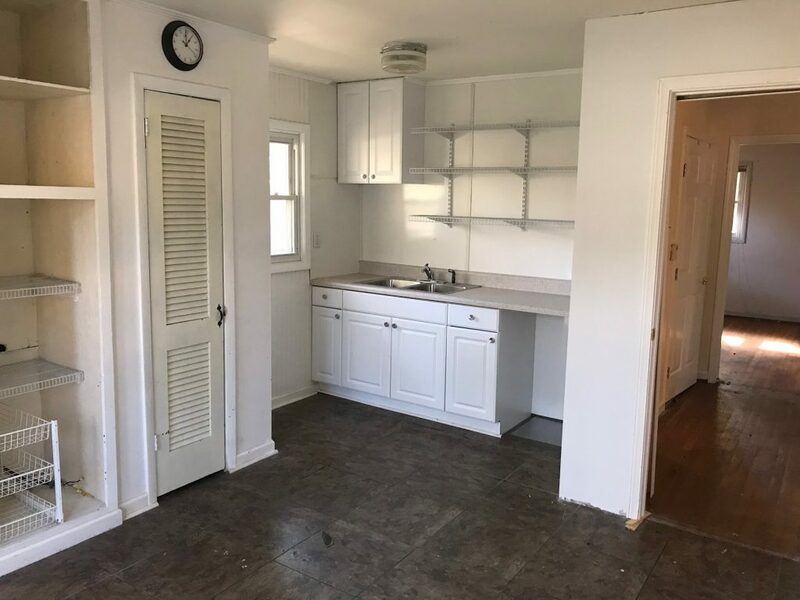 Maybe choose a project that just needs some cosmetics to help it sell. You can easily blow your reno budget when structural changes are involved. Interested in learning more about flipping, investment properties, or the Atlanta real estate market? 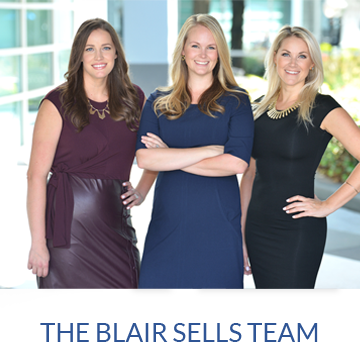 Email us at Blair@BlairSells.com or call us at 404.697.4559.